WFAE's Steve Harrison's report on the hearing's first day. Nearly three months after allegations of election fraud began to emerge in the 9th Congressional District race, the North Carolina Board of Elections is holding its hearing starting Monday. The five-member board will hear from its own investigators, witnesses and the campaigns of Republican Mark Harris and Democrat Dan McCready. Then, the board will consider what to do next. WFAE's Steve Harrison is covering the hearing in Raleigh, which is expected to last two to three days. Check back throughout the day for live updates. McCrae Dowless, right, has refused to take the stand unless granted immunity. Political operative McCrae Dowless has refused to testify before a state Board of Elections hearing in Raleigh unless he's granted immunity. Dowless is at the center of the state’s investigation into alleged absentee ballot fraud in the 2018 election in North Carolina's 9th Congressional District. After a brief closed session, the board of elections declined to grant him immunity. But the board said state law allows them to draw "negative inferences" from his decision not to testify. When the board rejected his immunity request, Dowless' lawyer Cynthia Singletary said he would not take the stand and he was dismissed. The hearing was adjourned until 9:30 tomorrow morning. Dowless was hired by the campaign of Republican Mark Harris, who leads Democrat Dan McCready by 905 votes in the 9th District race. McCready's lawyer Marc Elias said Dowless should be required to take the witness stand, when he could invoke the 5th Amendment if he wants. Political reporter Steve Harrison gives an update on first day of the 9th District hearing with "All Things Considered" host Mark Rumsey. Witness and Dowless employee Lisa Britt has finished her testimony. David Freedman, the attorney for Republican Mark Harris, asked Britt if she thought his client should be punished for the role she played in mishandling ballots in the November election. "No, I do not," Britt said. Britt maintained in an earlier statement that she believed Harris did not know anything about the election fraud. "I think there is one innocent person in all of this and that's Mark Harris," she said. Dan McCready attorney Marc Elias is questioning Lisa Britt. He is asking her about instructions Dowless gave her about placing stamps on envelopes so as not to attract attention from the N.C. Board of Elections. Britt says she never questioned Dowless because Dowless was a father figure to her. Witness and Dowless employee Lisa Britt testifies during 9th District hearing into allegations of election fraud. Elias asks Britt whether she knew for certain that Dowless did not throw away mail ballots. So far, Britt has not testified that she saw Dowless throw any ballots away or destroy them. Earlier in the day, she testified that she had picked up the mail ballot of a Democratic voter in Bladen County, Emma Shipman. She said Dowless told her to return that ballot because it was a voter being targeted by the Bladen Improvement Association, a Democratic-leaning group. The state has finished questioning Dowless employee Lisa Britt. 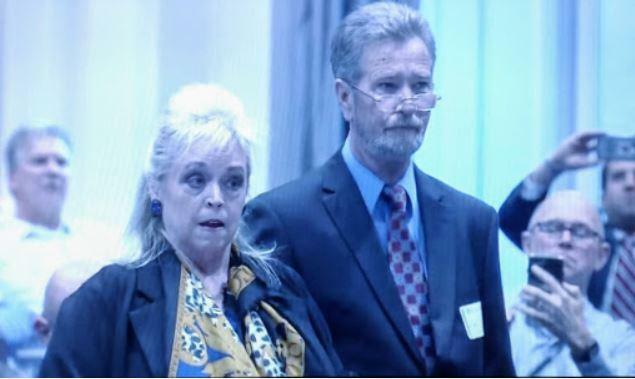 The hearing is breaking for lunch, and will resume at 2 p.m.
Britt said that after the Board of Elections declined to certify the race, McCrae Dowless asked that she and other employees come to his house. She says he told them, "As long as we stick together we are fine, because they don't have anything on us." "I can tell you I haven’t done anything wrong in this election and McCrae Dowless has never told me to do anything wrong. And to my knowledge, he has never done anything wrong. But I am taking the 5th Amendment because I don’t have an attorney and I feel like you would try to trip me up. I’m taking the Fifth." Republican Mark Harris listens to the 9th District hearing. In unofficial results, Harris leads Democrat Dan McCready by 905 votes. Britt also said that she believes Andy Yates of Red Dome Group, the Mecklenburg County political consulting firm hired by the Harris campaign, may have known about the absentee ballot scheme because Dowless and Yates were often talking on the phone about the number of ballots Dowless had. Her final statement is that she believes Mark Harris didn’t know anything about election fraud. "I think there is one innocent person in all of this and that's Mark Harris," Britt said. Bladen County resident Lisa Britt is testifying about her work for political operative McCrae Dowless. Britt said she and other Dowless employees worked in Bladen, Columbus and Robeson counties and were paid to collect absentee mail requests. She said for every 50 request forms, she thinks she was paid $150 or $175, and received money for gas and food. Britt said she once placed a stamp upside down on a ballot return envelope, and that Dowless told her not to do that. She said that if a number of envelopes had upside down stamps on them, it would look suspicious. She also said that she had signed her name too many times as a witness, and that Dowless also told her that would be suspicious. She then began signing her mom’s name. Britt told a story about she had collected ballot from a Bladen County Democrat. Dowless then called her and told her to return that ballot. The Bladen County Improvement Association, a Democratic-leaning group, had questioned Dowless as to why one of his employees had collected it. Britt said she returned that ballot. Britt said when she went door to door, she never tried to steer anyone on how to vote. “It didn’t benefit us, the workers,” Britt said. She said Dowless employees weren’t paid based on how people voted, just how many ballots they collected. A summary of part of the state board's investigation. North Carolina State Board of Elections executive director Kim Strach has just finished her preview of the state’s investigation. She said the state uncovered a “coordinated, unlawful and substantially resourced” absentee mail ballot scheme in Bladen and Robeson counties during last year's midterm election. Strach said her staff spoke with 142 voters, and they attempted to reach 401 voters. She said they also spoke with 30 witnesses. She said Bladen County political operative McCrae Dowless hired workers and paid them in cash. His people would get $150 for every 50 absentee ballot mail requests and $125 for collecting them. Collecting them is illegal. Strach said Dowless would keep ballots at his home and office. He sometimes filled in blank ballots himself at his office or home. In addition, Dowless would work to conceal the illegal collection of absentee mail ballots. If one of his employees forged a witness signature, he tried to make sure their signature was in the same color ink as the voter signature. Dallas Woodhouse, the executive director of the N.C. Republican Party, said he hasn’t heard anything yet to erase Mark Harris’s 905-vote lead.